Synopsis. (Goodreads) Most people want to save the world; seventeen-year-old Tora Reynolds just wants to get the hell off of it. One of the last survivors in Earth's final years, Tora yearns to escape the wasteland her planet has become after the sun turns "red giant," but discovers her fellow survivors are even deadlier than the hostile environment. Holed up in an underground shelter, Tora is alone--her brilliant scientist father murdered, her mother and sister burned to death. She dreams of living on a planet with oceans, plants, and animals. Unfortunately, the oceans dried out ages ago, the only plants are giant cacti with deadly spines, and her pet, Trigger, is a gun--one of the bio-energetic weapons her father created for the government before his conscience kicked in. When family friend, Markus, arrives with mercenaries to take the weapons by force, Tora's fury turns to fear when government ships descend in an attempt to kill them all. She forges an unlikely alliance with Markus and his rag-tag group of raiders, including a smart but quiet soldier named James. Tora must quickly figure out who she can trust, as she must choose between saving herself by giving up the guns or honoring her father's request to save humanity from the most lethal weapons in existence. 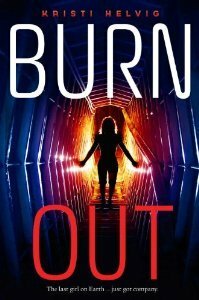 I am a big fan of the sci-fi genre so I was super excited about reading Burn Out and despite a few small issues, it was quite entertaining and a nice start to the Burn Out series. Seventeen-year-old Tora Reynolds is one of the last survivors on earth, she is eager to escape the harsh environment her planet has become, but with no one to help except a ragtag group of mercenaries; she needs to decide who can be trusted. What I liked best about Burn Out was the unique concept and interesting group of characters. Tora is strong and snarky, but still very relatable. Although she's trapped in a hostile setting with her life constantly in danger, I never felt like her predicament was hopeless. Kristi Helvig uses enough angst and her supporting characters to infuse the air of danger and mystery at just the right moments which leaves you anxious to know what is going on and eager to know whether Tora will get her dream of living on a planet with oceans, plants, and animals. Burn Out is an intriguing story full of action, threat and just the right amount of romance. You can’t help but hope for a better outcome for Tora after what she has been through, her inner strength and dedication to her father and his legacy made her a great character. I really enjoyed the sci-fi elements, we got to learn about some pretty high-tech equipment in this book and I’m envious of Tora’s ‘trigger’ – her personal weapon. The plot was fast-paced and riddled with danger, it was an intense journey as Tora tried to work out who could be trusted all the while protecting her father’s guns and evading the Consulate. The secondary characters each played an important role, Britta was interesting but not likable, Markus was number one on my do not trust list, Kale seemed to know what he was doing but James was the most mysterious of all and the character who I am most eager to learn more about, I am not completely sure about Alex as yet so I hope to see some more development to the characters in the sequel. The scientific explanations were where this book failed me, it just didn’t make sense and was too far-fetched but I was able to overlook these tidbits to enjoy the overall story. Overall, Burn Out was an enjoyable read with descriptive writing; I am unsure if my copy was complete as it abruptly stopped at around the 50% on a cliff-hanger so I am definitely keen to read the next installment. Thank you to Egmont for the opportunity to read and review Burn Out. About the author: Kristi Helvig is a Ph.D. clinical psychologist turned sci-fi/fantasy author. She muses about Star Trek, space monkeys, and other assorted topics on her blog. Kristi resides in sunny Colorado with her hubby, two kiddos, and behaviorally-challenged dogs. The cover is great! I think my expectations for these types of books are becoming high. I am not a fan of cliffhangers. Nice review! I am glad you enjoyed it for the most part. Thanks Ellen! Cliffhangers drive me bonkers.. I mostly liked this one, but the ending/the last 25% confused me a little. I love science fiction and usually have no problem reading and understanding and following scifi, but this one confused me some. I think I'll try and catch the next one though! Thanks Alyssa, did your copy end abruptly? I wasn't sure if my copy was complete - it was weird!